Have you considered the possibility of getting the beautiful smile you’ve always wanted, without braces? Now you can! Come see us at Uptown Dental Centre in Edmonton for a consultation with one of our dentists to determine if Invisalign® clear aligners are right for you. The Invisalign® teeth straightening system uses a series of clear, virtually invisible, aligners that allow you to comfortably go about your regular activities like eating, working, and sleeping. Wear Invisalign® at work; no one will know you are straightening your teeth! The removable aligners allow our patients to eat and drink what they want during the treatment process. Maintaining daily dental hygiene is no problem with Invisalign® because the aligners are removable for brushing and flossing. With no metal or wires, the flexible and clear aligner trays are more comfortable, and usually require fewer trips to the dentist during treatment than traditional braces. The clear aligner trays are working to straighten your teeth all day and night, only being removed when you eat, drink, brush, and floss. Invisalign® works while you do. How Can I Straighten My Teeth Without Metal Or Wires? Traditionally, metal and wire braces were the only option for patients wanting a straighter smile. New technology and new materials allow your dentist to straighten your teeth without metal or wires of any sort. 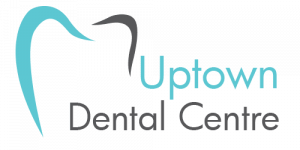 After a consultation with our dental team confirms you are a candidate for the Invisalign® treatment program, your dentist at Uptown Dental Centre will build and demonstrate your custom treatment plan. Invisalign® clear aligners are custom made using 3D computer imaging of your mouth for a perfect fit. This technology allows you to view your virtual treatment plan from beginning to end so you can see how your straightened teeth will look when your treatment is complete. Throughout your treatment, you will wear each set of Invisalign® aligners, top and bottom, for around two weeks before replacing them with the next pair in your series. Changing the aligners every two weeks allows for subtle changes week to week that result in a gradual straightening of your teeth into their predetermined final alignment. Unlike traditional braces, you will only visit us every six weeks or so to ensure that your treatment is progressing as planned, and to receive a new series of aligners. Total treatment time varies by patient and is dependent on the complexity of treatment required. Come visit us at Uptown Dental Centre for a consultation with our dental professionals to see if Invisalign® is right for your smile. All dental services provided by a general dentist. 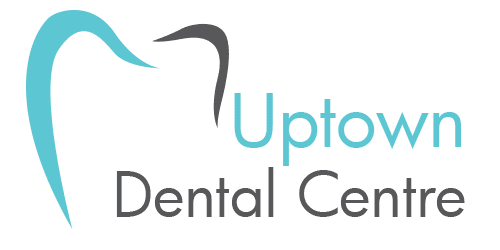 Book Your FREE Invisalign® Consultation With Uptown Dental Centre!